Amá would make these every New Year’s eve. I recall having a sense of wonder at how she made ribbons out of tortillas. When I make these now I recall happy times with amá, apá and all my brothers and sisters. These are as “party nice” today as they were then when I was a child. I cut and shape them just like mom did. First make flour tortillas but add 1 teaspoon sugar per cup of flour. Then roll the tortillas on a cutting board and slice them into 2″ wide strips. In the middle of each strip, cut a slit lengthwise with a knife, leaving 1 inch on each end uncut. In a deep skillet, heat peanut oil to very hot, shimmering, 350 F.
Take each strip and insert one end through the slit, twisting as in the pic. Deep fry it, turning so that both sides turn golden. This will take about 2 minutes. 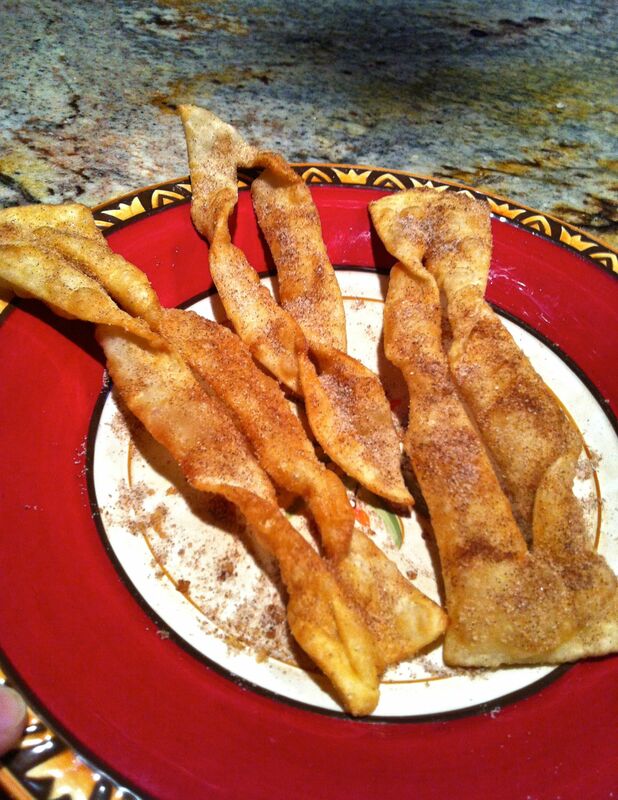 Place on paper towels and sprinkle with generous dashes of cinnamon and sugar. The cinnamon mixture should be 1/2 tsp cinnamon for every 3 tsp sugar. Serve with chocolate caliente. Wishing you a new year full of health, love and safe surround. ¡Feliz Año Nuevo!